Have you wanted a wonderful smile with beautiful straight teeth but don’t want metal braces? To get straight teeth, the metal braces option can not only be unsightly, but they can also be painful, cutting and scarring gums and the inside of your mouth. But having a lovely smile in today’s world is so desirable! Is there any other option besides metal braces? The great news is, if you want straight teeth, there is another option that is fabulous and invisible! At Hereford Dental Care in Monkton, we offer Invisalign® clear braces, the finest clear braces option today and one of the most common options for adult orthodontics. Invisalign clear braces give you a gorgeous smile. 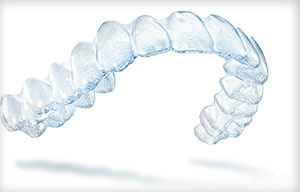 Invisalign consists of a series of clear aligner trays. Every two weeks, you will get a new set of trays that gradually straighten your teeth. Your Monkton dentist will give you several sets of trays at one visit, making it a very convenient system. Fewer office visits for you saves you some of your precious time! There are many advantages to the clear braces systems used by Invisalign. Because there are no metal brackets or wires, clear braces will never cut or scar your gums or the inside of your mouth. Invisalign clear braces don’t use the same type of straightening system as metal braces, which tighten the wires and can be very painful. Clear braces are invisible, so they aren’t embarrassingly unsightly. Invisalign clear braces are removable. This makes brushing and flossing remarkably easier and you can get that clean feeling after you brush. Metal braces make it more difficult to brush and floss, which can affect your dental health. Clear braces usually take less time to give you straight teeth than metal braces. Schedule a Consultation for Invisalign in Monkton Today! To get the straight teeth and the marvelous smile you’ve always dreamed of, call Dr. Longenecker today! Invisalign may be the teen or adult orthodontics option for you. We would be happy to tell you more about Invisalign clear braces, so come visit our Monkton dentist office near Parkton and Sparks MD. For more information about our clear braces and orthodontic solutions, please visit our Invisalign website!